Lime Green Metallic that is! What better way to greet the month of May, than with a Strat of bright green... This one is bright green indeed! And it's a John Cruz Masterbuild. Music Gallery Inc , of Highland Park, IL currently lists this one as new (COA date: 12/13/12). I love their listings for the complete & well formatted descriptions, specs rundowns and good photos. And the the feedback is 100% as of this writing. FAT is what this Strat is all about. Besides eye catching, features include: John Cruz Fat 50's pickups, vintage "C" (fat) neck profile and 6100 frets (fat) in a dark rosewood slab, 7.25" radius fretboard (more fat). Neck is quartersawn. 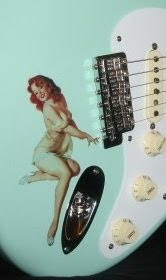 Includes COA, candy and a 60's brown tolex case, the color of which reminds me of a Wendy's Frosty (still more fat! ).